Make attractive online forms, collect feedback, and gather customer data today using one web service. Make conversational website forms in the AidaForm online form builder. It’s a complete service where you can create forms, share them, gather responses, and evaluate them in your member’s area. The AidaForm service generates the form code, collects form submissions, and keeps all data safe in your account, where you can view it any time you like. Add the online form to your website and start learning more about your visitors to reach your business goals faster. Choose from a variety of intuitive conversational forms: be friendly or professional, serious or light-hearted. Each form in this easy form builder is mobile-ready and customizable with simple drag-and-drop blocks. Instead of learning how to create HTML forms from scratch, sign up for the AidaForm form builder and focus on the questions you want to ask. Build online forms that get responses – with the AidaForm online form creator. In the online form maker, you can start with a blank form or select a template. Combine blocks into contact forms, registration forms, job application forms, customer satisfaction surveys, and so much more. Add standard fields like Name, Email, Phone, Date, Text Area, or File Upload, create multiple choice questions, and drop-down lists by simply dragging and dropping these blocks into your form. Choose a built-in design theme and customize the colors – and that’s it! Your form is ready. Now let everyone access your form: add the link to the form page to a button on your website. You can also share a direct link to your form on social networks. 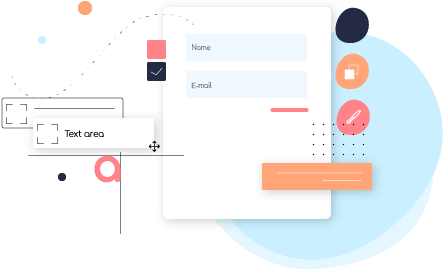 Whichever sharing method you choose, there is no need to set up any extra server integrations – everything will be processed through the AidaForm easy form creator. Don’t check your dashboard to see new responses – get notified when submissions happen. Just sit back and get to know your customers one person at a time. Export results as Excel documents or Google Sheets to analyze at your leisure. 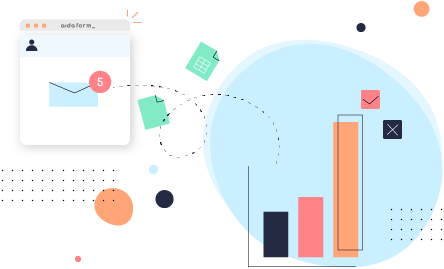 Evaluate the data in informative visualizations through AidaForm’s web interface and plan your business ahead. 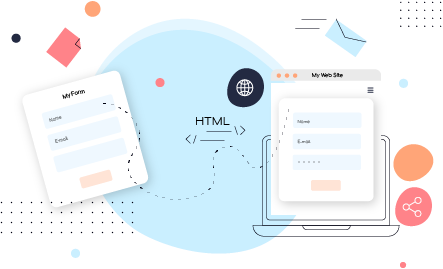 With the AidaForm online form service, you can focus on your business and automate the rest – it’s pretty simple: this form builder streamlines form creation. Makes sure real people submit responses and you get no spam in your notifications. For when you need a PDF order confirmation or a bug screenshot attached for the tech support. Add an extra visual punch to your online forms and style them to fit the design of your website.